I went on a walk through the Chelsea Art Gallery district yesterday afternoon. One of the galleries I visited was the Petzel Gallery and they have a show up by the New Zealand artist Simon Denny. The show is called Blockchain Future States and it compares Blockchain efforts like Ethereum and Digital Asset Holdings to the board game Risk. 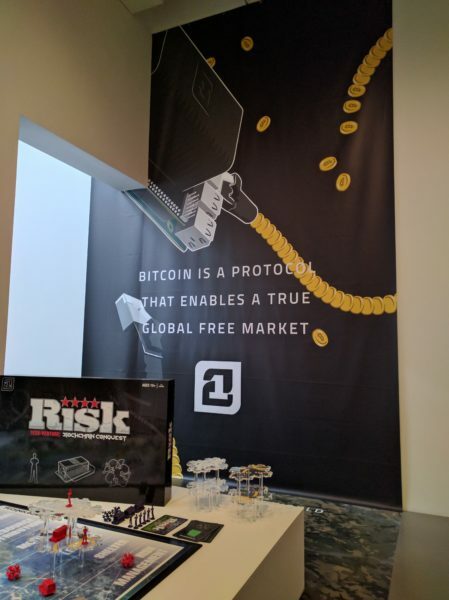 Given the comparison to Risk, I thought the name Blockchain Nation States would be more appropriate for the show. As I was walking out of the gallery, I saw a tweetstorm come through on my phone from Naval Ravikant. It’s a good one, talking about how open protocols are going to change a lot of things. But given the context of what I had just seen, this one particularly got my attention and I replied to it. 7/ Nation states that embrace blockchains will realize a windfall. Their devs & miners are the creators & maintainers of the next Internet. @naval are there specific nation states that seem to be doing the best job of this right now? I agree with Naval that open protocols and the blockchains that underly them will be the driver of the next big wave of technology and that they will force big changes that will ultimately impact the global economy. That’s a big statement and I don’t make it casually. I do believe this. The questions in my mind about this are when it will happen, which blockchains and protocols will emerge as the most important and valuable, and which nation states will embrace this and which nation states will not. Sitting here in the US, I think the US is not likely to be one of the winners in this next big technological wave because our government and institutions are captured by the incumbent economic system and companies that define it. So many of the blockchain companies we invest in are forced to seriously consider leaving the US or get bypassed by companies and technologies that are being developed more freely outside of the US. It is revealing that the big conferences where entrepreneurs, developers, and computer scientists gather to discuss the latest in blockchain technology are not often in the US. Last week, many in the blockchain world, including two people on our team, were in Shanghai to discuss the latest developments around the Ethereum blockchain. It does seem like China and its environs are emerging as an important center of gravity for blockchain technology. It is not too late for the regulators in the US to change their tune and become more open to these new technologies and the capabilities of them. But, like the game of Risk, large pools of talent are being built on other continents and countries now and eventually they will be unbeatable.